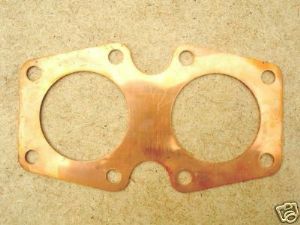 This is a new solid copper cylinder head gasket that will fit the unit construction 350 Triumph twins ie 3TA and T90 models from 1963-70. This is the "thin-type" gasket (0.020") that was originally fitted to 1963-70 models . We also usually have the thick head gasket for the earlier models which can be useful if you have a 1963 on model with a skimmed head, please check our other listings for these. Original part number was 70-0467.